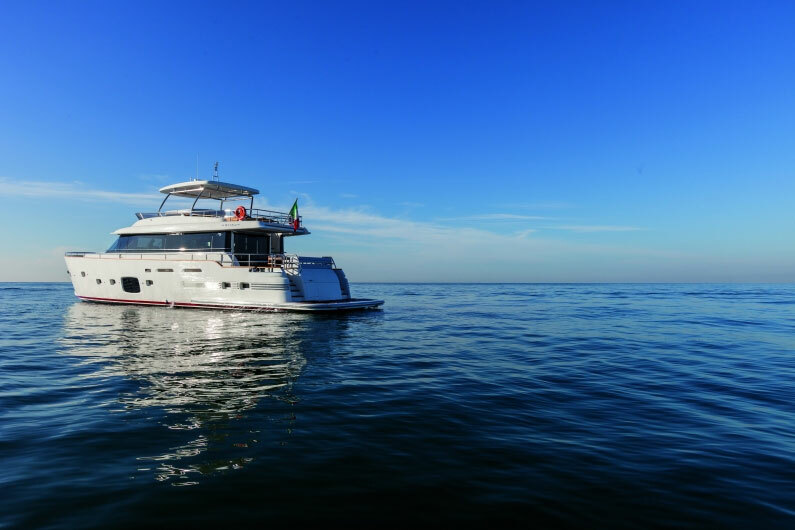 Azimut 50: Italian style and worldclass seakeeping ability. 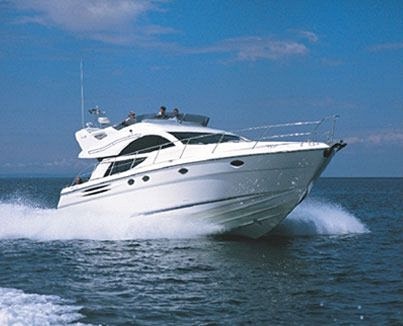 The Azimut 50 seemed oblivious to the conditions, and ran as smoothly as it would on a flat lake. It was one of those days when Mother Ocean can deceive you. Coming out the Port Everglades inlet at Ft. Lauderdale, the waters didn't appear too rough — and we didn't think they provided much of a challenge for the Azimut 50 we were testing: the latest performance motoryacht from one of Europe's premier builders. After all, this brawny Italian thoroughbred has a lineage of superb seakeeping vessels. Just after we cleared the breakwater, a huge wall of spray flared up from the bow. We didn't get wet on the bridge, but it was a reality check: Today was not the day to get too confident about sea conditions. Off in the distance, the horizon had a decidedly jiggly appearance — not the usual straight line. The offshore forecast was calling for greater than 15-foot seas. Because the strong winds were coming from the west, we would be sheltered close to shore. That's if you call 3- to 5-foot seas sheltered. 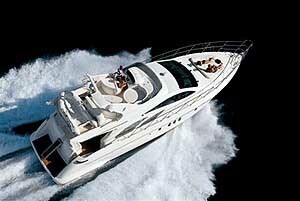 Our Azimut 50 responded immediately to throttle advance, and we were quickly at cruising speed. The boat seemed oblivious to the conditions, and ran as smoothly as it would on a flat lake. Heading into the waves, the hull tracked straight, with almost no reverberation from bow entry. It held turns tightly at 25 knots. At a top speed of 32 knots, it hardly felt like we were moving at all. The ride was very smooth and dry. Considering the conditions, we couldn't have asked for a nicer day on the water. 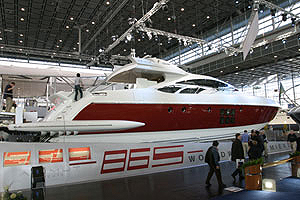 One interesting thing to note about the Azimut 50's performance was how quietly it ran. The sound reading on the bridge at full throttle was 79 decibels. There was a low, throaty rumble from the engines, but most of the sound we heard was wind noise. At a 26-knot cruising speed, the sound reading dropped a couple of decibels. However, surprisingly, it was about the same level at the lower station. The sound components were a bit different belowdecks, where there was more water noise instead of wind. 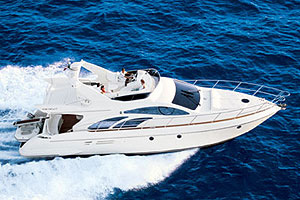 We found that the Azimut 50 performed with considerable brawn, but without any bluster. 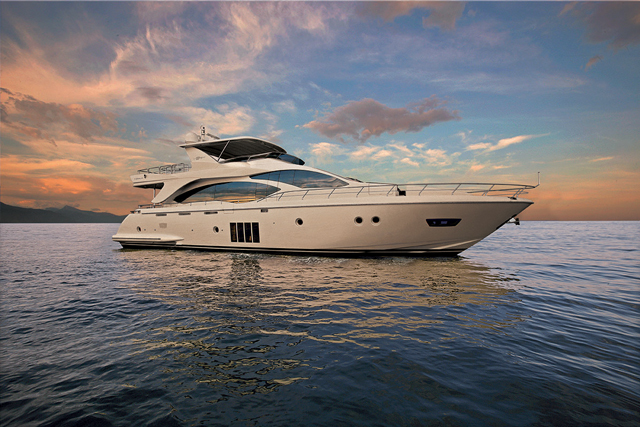 There's a phrase in the Azimut 50 catalog that reads "Out to sea, at the center of attention." Marketing talk aside, this boat definitely gets more than a cursory glance wherever it goes. The design scheme is an eye-pleasing blend of gently flowing lines, accented by window shapes that have become a hallmark of the Azimut look. No sharp points or right angles are anywhere to be seen. There's even a hint of 1950s retro chic in the fin shapes at the aft end of the flybridge deck. The flybridge seating moves from stern to bow along the starboard side as naturally as a stream flowing into a pond. It culminates in a large circular sunpad opposite the helm. A sectional, removable table runs the entire length. There's a doublewide bench seat at the helm — and immediately behind it is a molded fiberglass console that holds a wet bar. The aft end has space for an additional sunpad. A low-profile Venturi windshield does an excellent job of keeping the breeze out of your hair — and you can carry on a conversation without shouting while at cruising speed. The Azimut 50's cockpit is completely covered by the flybridge overhang. A bench seat runs the length of the transom. Our test boat was equipped with a factory installed passarelle. It's hydraulically operated and can serve as a davit for a tender stored on the swim platform. Another option is a crew compartment, accessible through a hatch in the cockpit. The space can otherwise be used for storage. 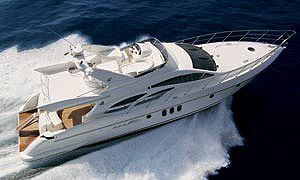 You enter the main saloon on the Azimut 50 through a triple-panel sliding door, aft. A U-shaped settee sits to starboard, with a wood table at its center. There was an electrifying surprise on our test boat: The settee converted to a double berth at the push of a button, and the table could be automatically raised or lowered by remote control. Another settee runs along the port side of the saloon. The space is an inviting sea of comfortable plushness. The lower helm station is forward and to starboard. As with the exterior styling, the console is a study in curves, with just a dash of retro. The instrument cluster is reminiscent of the gauge pods on a 1950s-era automotive dashboard. A large expanse of flat space beneath them allows for large-screen electronics displays. An attractively finished wood countertop, to the left, lifts to reveal the electrical breaker and switch panel. 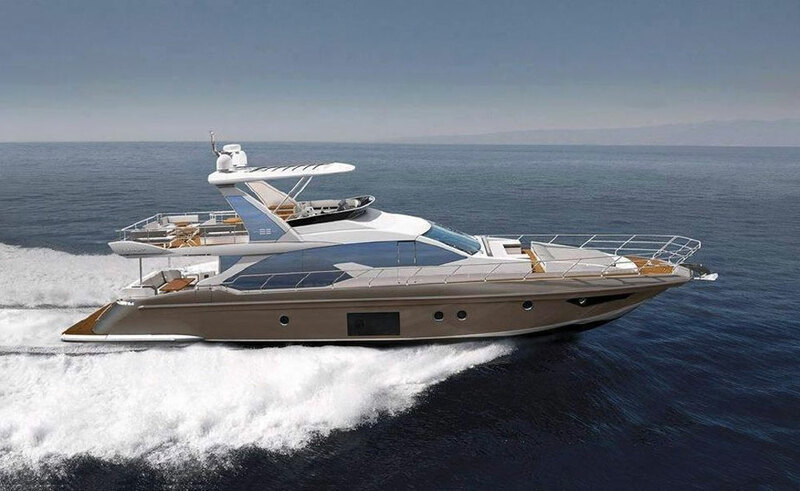 The Azimut 50 has an exceptionally attractive galley. It's along the port side in the forward part of the saloon and is open to the rest of the space. On our test boat, the wood cabinetry was accented by a speckled black Granulon countertop. The full-size upright refrigerator and microwave oven are behind wood panels. There's a three-burner stove, a double sink that is molded into the counter and abundant storage space. The line of the countertop curves outward at the stove, for a grabrail. It's something that will come in handy if seas are rough. 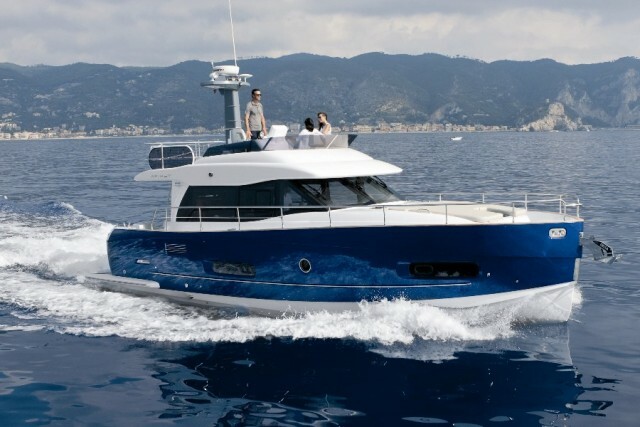 The Azimut 50 can be configured with either two or three staterooms. The boat we were on had two — with a layout that offers plenty of room for both the owner and guests. The master suite, forward, has a queen-size berth. There's a circular shower stall and a countertop done in an attractive liquid resin material in the head. The guest stateroom also has a queen-size berth, as well as a head compartment that's about equal in size to the master head. Headroom throughout the belowdecks area runs about 6 feet, 5 inches. There are two nice touches in the companionway that leads to the staterooms. One is an overhead clear panel that allows daylight from the windshield to flood the space. The other is a vertical rod that gives you something to hold on to in heavy weather. The three-stateroom layout adds bunk berths belowdecks, along the port side. Doing this, however, is a compromise: You'll need to give up some of the galley space. Whether you opt for two staterooms or three, you'll find the attractive Azimut 50 to be one accommodating boat — and one that will draw admiring glances from just about everyone you meet. Kohler 15.5 kw generator; three-burner range; upright refrigerator/freezer; Tecma heads; 54,000 Btu air conditioning; Raymarine autopilot, GPS plotter, VHF radio. Washer and dryer; plasma television in saloon; Glendinning Cablemaster; crew quarters; passarelle; bow thruster; custom interior. Hull is hand-laid solid fiberglass using multi-axial fabric and powder binding with neopentyl-isopthalic spray gelcoat. Sandwich panels with foam PVC layers are used in bulwarks and superstructure.